When Noah was born and growing from infant to toddler I always thought of him as my “real baby”. To me this meant he was my real and first experience at full-term pregnancy and birth. Of course, Eric was not full-term (26 weeks of real preemie) and was full-on adorable. But, what I never understood until after experiencing a full-term birth was how truly foreign the experience of a preemie mom is to those whose first child is full-term. It took my second time around and thirty-eight weeks of gestation to a real baby to understand why many people seemed so confused about my precautions and nervousness with Eric. Prior to bringing your preemie baby home you are told to not let anyone else hold him if you don’t have to, or at the very least, make sure the person to hold him has all their shots, no fever, no cold sores, no runny nose, no germ-festing-toddlers in their own homes, and maybe even just ask people to where a face mask just in case. And never, ever go into crowds with your baby! In the days before you bring your preemie home you are heavily schooled in feeding, diaper changing, daily temperature readings, weighings, breathing monitoring, burping, swaddling, and holding. There is someone ready at the waiting to guide you through nursing, pumping, and hand expressing every precious drop of breast milk. Then when you, daddy, and your baby have passed all the tests and are supposedly certain that the unsterile world outside the NICU is safe so long as you simply wash your hands EVERY TIME before you pick up you baby and keep him covered with a blanket as you stroll (so no one touches or sneezes in his direction), you are ready to roll home and be a new mother to your new baby. The difference is strikingly dramatic after you give birth to your second child at thirty-eight weeks. Hardly anyone instructs you on anything postpartum and yes, hand washing is important but no need to go crazy. Diaper changing, sleeping, feeding? Oh you got this, no worries. How about family and friend visitors or a snotty-nosed little brother with pink eye when you bring him home? No problem! You can be in the same room with people who are sick and not actual get sick! Who knew that covering your mouth and washing hands was so effective that this was possible? Certainly not something a new mom to a preemie knew. How about a trip to the grocery store in the stroller or a restaurant? Can I take my baby there? Of course, why wouldn’t you? Uuuh ok. You mean they won’t get sick when I expose them to Trader Joe’s to pick up some milk? Our first night home with Noah, our first full term baby, was comforting and special. After he was fed and settled next to us in his bassinet I laid my head on Aaron’s shoulder and wept a stream of uncontrollable tears of relief. I said “we did it”. We kept him in there for thirty-eight weeks. Thirty-eight weeks of hard work that included a cerclage , weekly progesterone injections, bi-monthly check-ups, no sexual intimacy (can’t have a contracting uterus), and monthly ultra-sounds. Now Noah is five. He has a tender heart and a mind of his own. He is stern and direct with his feelings and willing to speak the unspoken feelings for the whole house. He loves to be held close and snuggle up, and fifty-pounds heavy prefers to be carried but understands when he can’t be. He trusts his brother to teach him well, but doesn’t let him rule his world. He is a silent observer before fully committing to interacting in new territory. Both our boys are special beyond words and have provided life-changing experiences allowing us to tap parts of ourselves that may have otherwise gone unrealized. My challenge will always be to teach back to them what that so graciously teach me each day. Mothering two active and enthusiastic boys requires more strength and fitness than running often does. I am still unclear if training keeps me fit for mothering or if mothering keeps me fit for training. 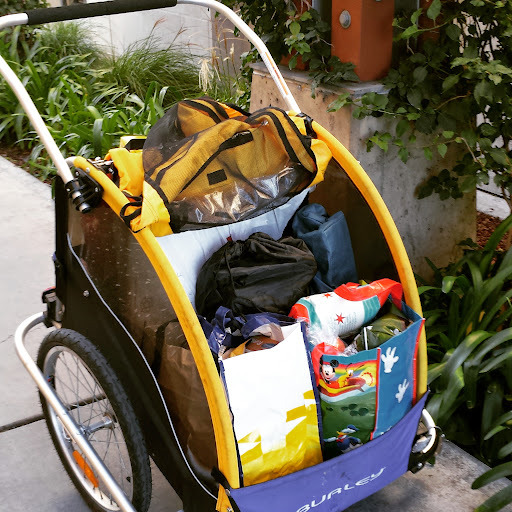 Pushing ninety-pounds of boy + big wheel + snack rickshaw-style from swimming lessons to little league at eight-minute mile pace so we aren’t late for the game is certainly strength building. Driving is of course an option if I want to spend my entire Saturday sitting in the car, sitting at the lesson, and then more sitting at the game. Using human power to get where we need to go as often more fun, faster (no searching for parking! ), and efficient. Run with them then stretch on the sidelines seems to be an all-around win for all! A grocery store “run” becomes an excellent conditioning workout. Sometimes you have just have to rethink your workouts to find the time train or simply move more!